Like the tango fruit salad, this dish looks surprisingly good for how easy it is to throw together. The one trick is to not use water-based food dyes (I completely failed at this my first attempt), which causes the chocolate melt to form a weird goop. One thing I learned when I posted this picture to reddit is that not all parts of the world have salty baked goods coated in chocolate. If your reaction to this snack idea is "gross, salty and sweet?" I particularly encourage you to try it! I was able to find all these items in the baking section or the snack aisle of my local, ordinary grocery store. Optional: 1/4 cup icing sugar + 1 tbsp water + 4 drops blue food coloring. Oil-based food coloring like these will not cause the melted white chocolate to seize. You can also use powdered food coloring, but I wasn't able to find that at my local grocery store. If water-based is all you have and it causes your chocolate to gloop, you can try mixing in 1 tsp vegetable shortening per 6 oz chocolate to make it smooth again. I used these, but you could use other sprinkles that you might have on hand. Or just omit! Cover your counter with a sheet of parchment paper for resting the chocolate-coated pretzels as they cool - melted chocolate gets a little messy. If your packet of melting chocolate came with instructions, follow those. Otherwise, pour the chocolate melts into a large microwavable mug or other tall vessels. Microwave at 50% power for 1 minute, and stir. Continue microwaving and stirring 30-s at a time until all the chocolate is evenly liquid. Add 3-4 drops of oil-based food coloring and stir well. Compare the color to the glowy green color of dota 2 magic sticks and add more food coloring as necessary. Remember, it's much easier to add more food coloring than take it away! Once the color right, tilt the bowl or mug containing the chocolate onto its side, and scrape the dipping into a puddle. You're doing this to get a longer surface area for coating the pretzel tips. Roll a pretzel rod over the surface of the melted chocolate to coat the top third evenly. and then place it onto your parchment paper. If it starts getting too gloopy in between rods, try mixing or reheating the melt. Before the chocolate finishes solidifying, top off with sprinkles. I had my roommate do the sprinkling while I did the coating, but if you're working solo, you may want to dip 3-4 sticks at a time and then sprinkle them. Let them cool until the chocolate solidifies. Optional: Add blue drizzles on the base for the wrappings! Mix 1/4 cup icing sugar with 1 tbsp water and 4-5 drops of water-based food coloring. Stir into a paste. This paste will lighten as it dries, so aim for a color a little darker than what you want your final result to be. 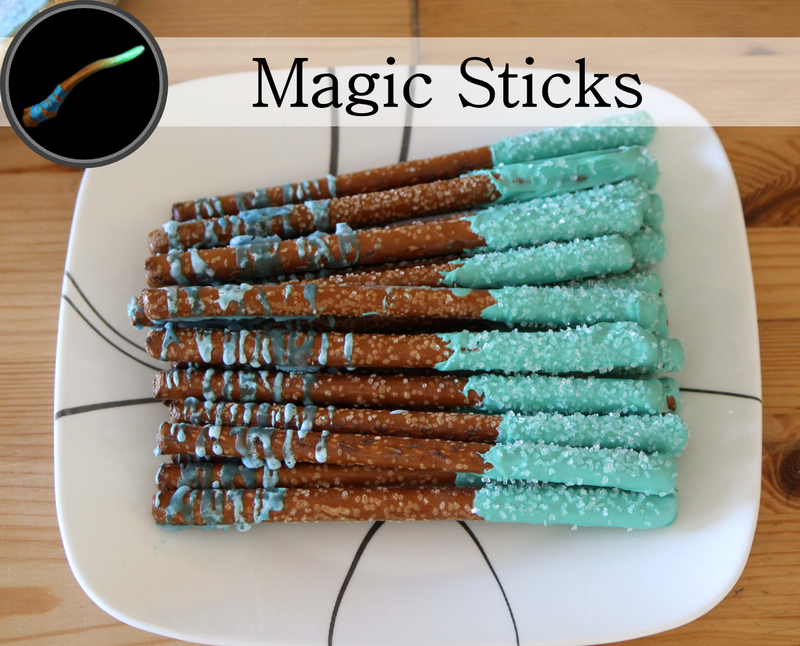 Use a spoon to drizzle strips of blue onto the base of the pretzel sticks. If the drizzles are too drippy, add a little more sugar. If the paste is too difficult to drizzle, add a little more water. While putting together this post, I learned that sticks and wands have the same flavor texts! How's that for some obscure and useless Dota trivia? I feel like that's a missed opportunity for some interesting lore. What exactly is the difference between sticks and wands?